section of northbound I-405 by summer 2017. 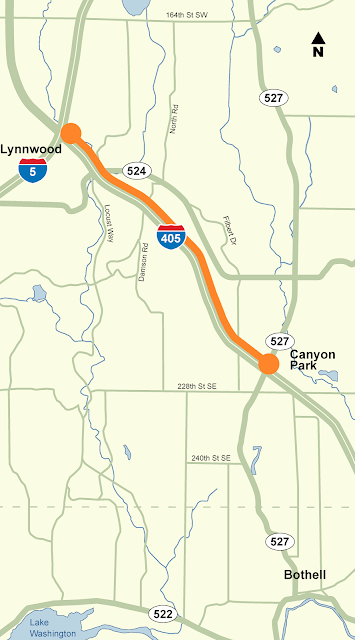 If you’ve driven the north end of I-405 in the Bothell area lately, you know that heavy traffic remains a big headache for travelers, especially northbound during afternoon rush hour. The issue is fairly straightforward: too many vehicles, not enough space. We have both short-term and long-term plans to add new roadway capacity that will help smooth out these trouble spots. Today we have some good news to share: we’re moving forward with our first set of improvements even sooner than expected! Originally, the Legislature funded this project with an expected opening date in 2018. However, thanks to higher than expected revenues from the I-405 express toll lanes and some changes to the project scope, we are now able to fund and get started on this project even sooner than expected. That’s right: I-405 toll revenues are already being reinvested into the corridor. Next summer we plan to open new northbound capacity, called a peak use shoulder lane, which will extend about 1.8 miles between SR 527 and I-5 (you may have also heard it referred to as hard shoulder running). As the name suggests, we plan to make some roadway changes that allow us to open the right shoulder to general purpose traffic during times with heavy traffic. By building more capacity to handle the afternoon traffic entering from SR 527, we expect to clear out much of the congestion that travelers are experiencing, especially in the area of the SR 522 interchange, where I-405 narrows from five lanes to three lanes. It’s worth noting, of course, that we can’t erase all congestion. Because vehicles will be able to travel north more quickly, we expect to see some more back-ups at the I-5/I-405 interchange as drivers reach northbound I-5 and its heavy congestion. How will the peak use shoulder lane work? Dynamic lane control signs, much like the ones you see today on I-5, I-90, and SR 520, will let people know when the peak use shoulder lane is open to traffic. In general, the lane will be open during the afternoon peak period (3 to 7 p.m.), when drivers need it most, but it will also be available to help manage the highway for incidents or other unexpected congestion that can occur. We also recognize that the shoulder will still be needed for maintenance, emergency services, and vehicle breakdowns. Dynamic lane control signs like the one in the picture below will help us manage those uses, so it’ll be very important for drivers to pay attention to those messages. We’ll have a lot more to share about how to use the new peak use shoulder as this project moves forward. Signs like this one will help control traffic on the new I-405 peak use shoulder lane. Why is there so much congestion up north anyway? When we completed improvements on I-405 last September, we only had funding to build a new lane between Northeast Sixth Street in Bellevue and south of the SR 522 interchange in Bothell. North of SR 522, we left the amount of lane capacity unchanged. Before we added the new lane from Bellevue to Bothell, northbound traffic used to get stuck farther south in the Kirkland area during afternoon rush hour. Since we added the new lane and launched express toll lanes, we’re moving more vehicles through this area faster. On average, somewhere between 17 and 24 percent higher volumes during the peak commute than before express toll lanes, according to our nine-month data. But when this much larger wave of cars reaches Bothell, where the road narrows, they hit a bottleneck causing significant congestion. Add to that the busy SR 527 interchange, where nearly 1,000 cars an hour are merging into those full northbound I-405 lanes during afternoon rush hour, and we see big backups. To be fair, with the growth in the area over the past few years, this section of roadway didn’t have enough capacity to handle all the cars that need to pass through even before express toll lanes. We know we aren’t finished making improvements yet. The long-term I-405 Corridor Master Plan ultimately calls for rebuilding the SR 522 interchange and adding more lanes which will create a dual express toll lane system that extends north to I-5. The Legislature asked us earlier this year to seek new ways to phase this big project so that we can reduce its cost and build critical pieces sooner, and that’s exactly what we’re doing right now. Stay tuned for more information on our progress. How can I learn more about these upcoming projects? 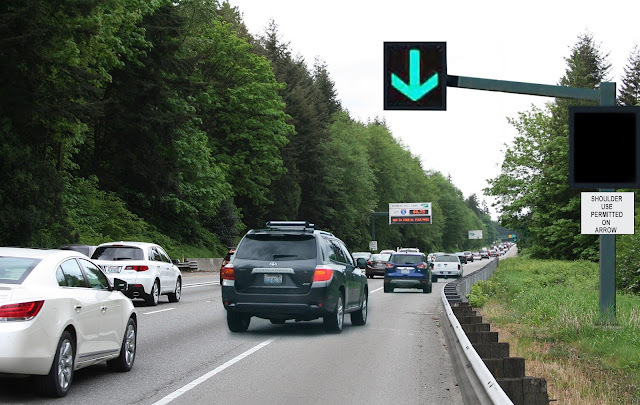 WSDOT plans to host an open house about this new peak use shoulder project 5 to 7 p.m. Thursday, Aug. 18 at Bothell City Hall Council Chambers. It is open to the public, and we look forward to seeing you there. The extortion toll lanes have been the biggest mistake in transportation history. They have made congestion in the corridor much much worse and everyone knows it. If you really wanted to improve capacity you would add another general purpose lane NOT a shoulder. The truth is the Texas company where 70% of the toll money goes discourages adding general purpose lanes that way congestion continues and more money comes in. What a joke. Shame on you! If you really wanted to help with congestion you would suspend the extortion tolls and add another general purpose lane as we were originally promised in the master plan. WSDOT has zero credibility and continues with the propaganda. We will get rid of these tolls! Real lanes for Real People! Totally agree with Helena. Their "solution" of opening up the shoulder, rather than giving us one of the toll lanes back as a general purpose lane, is stupid and UNSAFE. What happens when a car breaks down and needs to pull over to the shoulder? The people have spoken and told the WSDOT what they want, but the WSDOT doesn't care. Can someone please tell me how to vote these jokers out of office? Congestion has moved around but it's clear that there are areas of the freeway with significantly less congestion. If you live in Kirkland or further south, your commute has probably gotten better. Unfortunately, the congestion from SR522 northward erases any of those gains for people living north of there, at least until double express lanes are built through to I-5. Jenna asks, what happens when a disabled car needs to use the shoulder - that is explained in the article. On demand signage will close the lane until the obstruction is removed. And there is no second toll lane to give back in that stretch because there is only one toll lane there to begin with. Another immediate improvement that could be made would be to add more toll lane entry/exit points. Someone getting on southbound 405 at 195th st, for example, has to travel south of 160th before they can enter the toll lanes. Similar problems for anyone traveling SB I-405 wishing to exit on to SR522. It takes too long for carpoolers and toll users to enter the express lanes, so the general purpose lanes are more backed up than they otherwise would be. The best and only solution to fix this problem would be to suspend the failed extortion lane on I405. Then add the general purpose lanes we were originally promised in the 2001 master plan. The reason WSDOT is adding a shoulder lane is to desieve the public to pretend they are trying to make congestion better. The dirty little secret is that WSDOT and the Texas company don't want to add REAL lanes since they want the general purpose lanes to fail to create more revenue. What a joke. General purpose lanes are the answer, but WSDOT and there propaganda machine will continue to spin it and say other wise. The B.S. meter is off the scale with this one. First, the money was already approved during the last legislative session and was just waiting to be released. Second, WSDOT could have done this 3 years ago and for just $11 Million made a legitimate improvement instead of wasting the time and money on the hair-brained idea of implementing toll lanes for $111 million. It would have actually improved traffic and **saved $100 million of our money** that was wasted in tolling equipment and does nothing to reduce congestion. Third, while it will cost WSDOT $11 Million to make the improvement, it is costing the citizens over $20 million in tolls collected from us!!! Fourth, WSDOT didn't even come up with the idea of using hard shoulder running. Sad that the public had to tell them to do this. Pathetic actually. I can't believe WSDOT continues to stand behind this failed experiment. The extortion tolls have made traffic much much worse and everyone knows it. We are going to fight these extortion tolls to prevent expansion to the southern part of I405 and have them suspended on the northern end. After the election things are going to change!!! The major issue with your failed HOV lanes is simple. They are on the left lane! Unless you have dedicated exits and on-ramps for the entire duration of the HOV lane, people will think of these lanes as nothing more than fast speed express lanes instead. Just look at when traffic isn't congested and you'll see reckless drivers speeding on the HOV lanes who think they're in the express lane. Traffic has to criss cross all lanes of traffic to use them so that creates slowdown situations in rush hour. It would get slower vehicles such as buses to stay to the right where slower traffic should be instead of the vehicles having to cross over and impede everyone. A proper solution would be to move all these HOV lanes to the right lanes instead since people in this area have a bad habit of camping left and middle lanes as they don't want merging traffic to impede their travel. Before going into effect, I can tell you this will not fix the problem. Look at the issues. We have two lanes that block up at the 527 (Bothell Everette Highway). The exit lanes starts to back up... people decide they will wait until the last minute to cut in. They stop in the second lane leaving NO GPLs open for traffic. Opening the shoulder will not fix this problem. Using the estimates that were given for the extension of GTG south of I-90, the cost to actually fix the issues created by GTG will be close to $1,500,000,000 (one and a half billion), or three times the initial cost of implementing GTG. I also find it somewhat disturbing that the governor is surprised by the congestion issues when touring the fire damage in Bothell. This is for a program that he is promoting and has sponsored. Is he just ignoring the feedback of citizens of the state or is WSDOT providing bad data in their reports? Either way, he is asleep at the wheel on GTG. Here is another pet peeve. WSDOT spent millions of dollars advertising GTG. I saw it on billboards, I saw it on just about every web site I visited, I saw it on TV, I heard it on the radio.... for MONTHS. How much budget was spent on letting people know there is an open house to discuss the problem with the public. I measured the space in our local newspaper. This hugely important topic warranted a 2 1/2 inch by 4 inch space in an area on page 4 of 12, on the fold at the far left... in other words.... almost impossible to find if you were looking for it... oh and there is one days notice. 2017, contractor crews will modify the right shoulder of northbound i-405 to serve as an additional northbound lane during times with heavy congestion, typically afternoon rush hour. The new peak use shoulder lane will be controlled with overhead electronic signs and open to all traffic by summer 2017. When: 5 to 7 p.m. Thursday Aug 18, 2016. No formal presentation will be provided. Attendees are welcome to come and go at their leisure during the two-hour event. The meeting location is accessible by public transportation. I should add that on both pages, this appears in a location that is super hard to find if you look for it. I urge everyone to get to that meeting. I wish I had more than a days notice because I would surely have tried to make this if I could. In my opinion, taking a year to prepare an existing shoulder for use it outrageous and will not actually fix the problem. Further, although the area North of 522 is now a hellish commute, 405 is still a quagmire of horrible traffic that WSDOT is claiming a huge success. So, to recap, the Extortion lanes are SUCH a success at moving traffic that you've had to authorize buses and cars to drive on the SHOULDER of the road? Anyone with a brain (which excludes W$DOT as a whole) would realize that this would be the only reason needed to deem this entire extortion scheme an epic failure. But hey, as long the money is rolling in, W$DOT thinks everything is fine. I have lived in several larger metro areas than Seattle, and in every case the DOT is looked at as a benign entity that builds/maintains roads. W$DOT is the first I have encountered that I look at as a true enemy of drivers that needs to be fought at every turn. Their greed and incompetence (viaduct tunnel, 405 Extortion) is truly stunning. We should cut WSDOT some slack. WSDOT's job is try to make traffic move more smoothly. Of course, that wouldn't be an issue if everyone could live closer to the jobs. For 8 years, I lived and worked in Federal Way. When that job ended, all the new jobs were in Bellevue but who can afford to live there? After six months of driving Federal Way to Bellevue, I decided to accept a job in Los Angeles because I knew I'd have more commuting and housing choices. As long as the Puget Sound keeps expanding out and allowing some cities to hoard jobs without any plans to have enough housing nearby, the problem will persist. And that's not WSDOT's fault, they're just in charge of building roads.